One of the biggest sparks that set off the Egyptian revolution was blacked out of the US media. That spark was widespread anger that Mubarak's regime collaborated with the Israeli Mossad to bomb a Coptic church in Alexandria on New Years Eve - and blame it on Muslims. The whole Middle East saw right through it immediately, and the Egyptian people's disgust was a big part of what led them to overthrow Mubarak. False-flag terror only works on populations that don't understand it. The vast majority of Middle Eastern people know that 9/11 was an inside job. They have been on the receiving end of continuing Zionist false-flag terror for sixty years. Daily Kos: Egyptian bomb drops - Interior Minister threw it! IlLoubnan (Lebanese newspaper): Mufti Qabbani: "The assault is a criminal act with Zionist finger prints"
Had it not been for the remarkable uprising in Egypt this last week and a half, the church bombing that killed 24 in Alexandria last New Year's Eve would easily serve as justification to fear Muslim extremists in the region. Instead, we have learned now that Habib el-Adly, former interior minister of Egypt, is a suspected mastermind in the deadly church attack with the intent to blame it on Islamists, escalate the Egyptian government's crackdown on them, and gain increased western support for the Egyptian regime. The two patsies, Jundullah leader Mohammed Abdelhadi, and frequent prisoner and Muslim Brotherhood supporter Mohamed Khaled, were apparently set up to meet after the explosion by interior ministry officer Major Fathi Abdelwahid to evaluate the success of the attack. During their meeting, Major Fathi Abdelwahid and his security forces promptly arrested the patsies. This neat operation with the "suspects" in custody was suddenly upended when mass uprisings lead to the prison break. The two patsies fled to the British embassy in Cairo and reported that the plot was developed by Interior Minister Habib el-Adly. Apparently, under el-Adly's orders, Major Fathi Abdelwahid recruited the Jundullah leader and the Muslim Brotherhood supporter to wire a car with explosives, hire a driver (Abdelrahman Ahmed Ali) to bring the explosives to the church, then detonate the bomb. The two escapees claim Major Fathi Abdelwahid detonated the bomb before driver Ahmed Ali could escape. After this information hit the English embassy and various news outlets, Egypt's general prosecutor opened a probe on former Interior Minister Habib el-Adly's role in the bombing via proclamation 1450, which refers to British intelligence documents and points to the news reports sourcing a UK diplomat. This diplomat explained the reasons why Britain has insisted on the immediate departure of Egyptian President Hosni Mubarak and his regime, especially his interior ministry's security apparatus previously directed by el-Adly. If the accusations are true, what do these developments mean? 1. Hosni Mubarak is a likely accomplice to this activity, because Habib el-Adly worked directly under Mubarak up until he was replaced on January 31, 2011 (the night of the explosion), as part of a cabinet reshuffle aimed at appeasing the 2011 Egyptian protests. 2. The U.S. must be aware of this development and were likely informed by English authorities once the patsies reached the embassy. England's strong stance against Mubarak must have weighed heavily with the U.S. leaders and this false flag attack had to be part of the conversation. 3. It is highly probable that Omar Suleiman was aware of these operations. Egypt's exterior security apparatus, the Egyptian General Intelligence Service, was run by Omar Suleiman since 1993 until his appointment as Vice President of Egypt two days before the explosion. 4. The operation suggests an ongoing campaign designed to foster fear of the Muslim Brotherhood within Egypt and throughout the world. If the government of Egypt has to kill its own citizens to convince the rest of the world to fear Muslims, that fear is likely exaggerated. This is consistent with reactions from Coptes in the area who do not seem to have bought the idea that the Muslim community has suddenly become hostile and dangerous. Apparently, the attack in Alexandria was not successful in achieving its goal of creating fear of Islamic extremists within Egypt. 5. This attack on a Christian church was described by Hosni Mubarak as an attack by unnamed foreign elements. It was meant as a suggestion that Al Qaeda or Hamas was somehow involved. Despite the absence of any cell affiliated to the label of Bin Laden, the minister presented the Gaza Strip as a true seedbed of terrorists more or less dependent on Hamas and Al-Qaida. This attack had the requisite ancillary elements meant to justify the siege against Gaza. So far, U.S. news has remained silent over this story, but the official site for the Muslim Brotherhood has printed the story, Hamas has issued a press release in response to this story, various Arabic papers have printed their versions of the story and Ramzi Mamdouh, the prosecutor who issued proclamation 1450, has spoken with Al Jazeera. Should the allegations be true, it would mean that the U.S. is throwing its endorsement behind a government that kills its own citizens in order to justify hatred of Islamists and escalate the Egyptian government's crackdown on its citizens. Islam and Sharia teaches hate, intolerence and violence. Islam and Sharia are the teachings of the Devil. Islam and Sharia teaches hate, intolerence and violence. Islam and Sharia are the teachings of the Devil. Its better to have no faith than to follow Islam. Evidence that Islam is the best version of monotheism: Muslims never rant and rave about Christianity being the teaching of the devil. 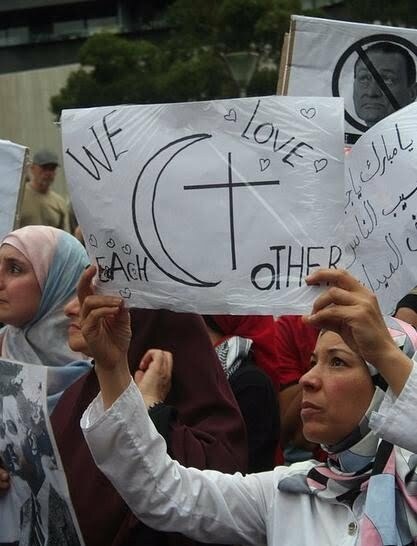 Muslims have no hatred of Christianity, because their religion does not teach hatred. Many Christians, however, are driven by a fanatical hatred of Islam. This shows that there is something very wrong with Christianity, or at least today's version of it. Obviously, Christianity is teaching hatred.